Before Dominion mechanics, major empires were already a fact. Ascendant Frontier settled a large part of nullsec years before Dominion. Band of Brothers beat them long before that expansion too. They built the first actual coalition of EVE: The Greater BoB Community. They controlled large parts of EVE nullsec for some time with their own power and Mercenary Coalition as a mobile deployment unit. Their main antagonist became yet another coalition: Redswarm Federation. They were comprised of Goonswarm, Tau Ceti Federation, Red Alliance and United Legion. That group had formed to fight yet another group of alliances: the old Southern Coalition of mainly Russian players. By the time when Band of Brothers declared Redswarm Federation their mortal enemy, blob warfare had emerged as a staple of sovereignty conflicts. Band of Brothers defeated Ascendant Frontier and ruled their empire with a doctrine based on highly skilled members in powerful ships. Redswarm Federation was a coalition that did not build its power on skill alone. Their doctrine was based on mass mobilization. Sovereignty mechanics worked differently back then. There were no SBUs or TCUs. It all came down to who had the most POSes in system. It was a horrible grind, especially in the systems with lots of moons which were of course copiously seeded with POSes. I still remember that from my first months in nullsec just before the Dominion expansion came in the winter of 2009. Redswarm Federation gathered large numbers to deal with that grind and their opponents alike. It became accepted fact, that mass movements can, and will, beat smaller alliances, no matter how elite they are. After that victory the question remained what one would do with such immense numbers of nullsec players. It wasn’t like you could send them all to highsec or lowsec after the war was won. 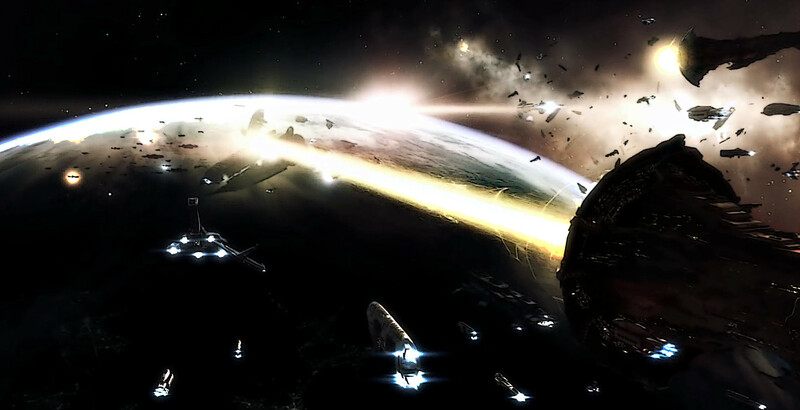 Since every single system can only sustain a limited number of people financially, more had to be conquered to provide comfortable income for the thousands of players among the emerging powers of nullsec. To defend their space effectively against the remaining hostiles, Goonswarm in particular kept pushing the envelope with their newbie drives to maintain their numerical advantage. Test Alliance later adopted that recruitment strategy wholesale from their Goon mentors. Both rejected the idea that nullsec should only be for the most highly skilled elite players. Their message was, that every week-old player could be part of the nullsec endgame from the get-go. More and more players with little experience were recruited directly into nullsec. Those people needed income, guidance and security to develop and prosper. One of the best ways to provide that is by creating safe zones. Ratting space deep within alliance territory protected by several bubbled chokepoints, gatecamps and intel channels. Controlling large territories became a necessity if an alliance wanted to maintain an environment where the inexperienced and unskilled could survive. That incentive for the creation of large empires has nothing to do with game mechanics. Rather than that, it is a direct consequence of the way certain nullsec powers chose to organize themselves. When Dominion came into effect, system control became dependent on the deployment of expensive sovereignty structures. The prior growth of nullsec empires also required investment in system upgrades and outposts for the many members they had to sustain. Today, the amount of structures that need to be taken down is lower, but grinding remains an issue. The proliferation of outposts throughout nullsec means, that ever more structures with immense amounts of hitpoints have to be conquered to secure a system. In the end, the difference in grind between pre-Dominion and post-Dominion is not that significant, but how major powers constitute themselves and how war is waged has changed notably. There were basically two paths of adaptation. The mass movements had to assemble ever higher numbers to manage the grind, and those who possessed supercap superiority had to expand in that area to work through the same timers with smaller numbers. Large sov-warfare fleets comprised of low-skillpoint players result in higher pressure on ship replacement programs because of higher losses. That contributes to the dynamic of escalating costs which require further expansion to cover. To do so, major passive income streams are needed. After a certain size is reached, an alliance or coalition can hardly escape that vicious circle. On the other side, the remaining old-school elitists need to participate in the same arms race to remain competitive. The likes of Pandemic Legion. NC. and Nulli Secunda may still adhere to the doctrine of powerful players with high skills, but even a supercap fleet can be brought down by massive numbers if it is not large enough by itself and supported by ample numbers of smaller ships. Sure, you will need less of them, but they are also much more expensive. On top of that, sovereignty is required to even build those ships. The concept of renting out space to lesser alliances became the premier method to finance and construct those powerful fleets. The last consequence for both sides was to impose limits on themselves and each-other. Now treaties and agreements are in place to guarantee the safety of an infrastructure that has become an end in itself. Sov-nullsec is about empire building. Empires require established structures. Those inevitably result in the reduction of possible choices one can make. No alliance of sov-nullsec can avoid that nowadays. To wish for a more dynamic and “fun” sov-nullsec under such conditions is like wanting to have the cake and eat it at the same time. It has been stated many times that EVE has a steep learning curve. Creating shortcuts to bypass that development process creates its own set of compounding factors adding to the problem. Players who are directly recruited into nullsec, are not required to learn playing EVE on their own terms. They are instructed to play it a certain way which has been established as “correct” by others over the course of years. Again, this is not a direct consequence of game mechanics, but a result of the feedback cycle nullsec empires are caught in. Since new players have not had the opportunity to understand that dynamic fully, let alone influence it, they have no choice but to follow the lead of others. Of course those leaders are then beholden to provide exactly the experience which they have promised their new players. As previously stated, they also need an established structure which protects them and provides for them. The alliances which rely on this massive influx of newbies therefore need to make sure they can offer that structure, and so the cycle continues. Today, the consensual wisdom on how to play and succeed in sov-nullsec has become so deeply entrenched, that there is almost nobody left to question it. Least of all the new players who join up and have absolutely no way of knowing anything else. There are indicators which show just how inescapable the self-imposed systematics of sov-nullsec have become. One of them is the change in narrative within the CFC. For a long time they were vehemently opposed to the concept of renting out space. Yet they saw no other choice than doing it after they lost their income from the Technetium bottleneck. Their opponents have developed massive renter empires which provide an income stream that can finance their expensive fleets. The balance of power had to be reestablished, and so it happened. Since the development which lead us to this started before Dominion sov-mechanics, I would therefore question the notion that any change coming from CCP will solve today’s issues. Real change can only come if the various sov-nullsec alliances actively break out of the mold they have created for themselves. The meta regulations which have been put into place by the big powers already show a desire to move away from the current state of affairs. Unfortunately those recent agreements mostly lead to more stasis, but they might also point to a possible way out: if several major powers can negotiate such extensive self-limitations, they could also agree to reduce their numbers and split into smaller entities which act independently. They could release all unnecessary systems from their control until they have consolidated to a point where they can continue with a clean slate. Because they effectively control so much of EVE nullsec, they could actually manage to prevent unwanted conquests until the time has come for new players to enter the field. Most, if not all, of the large alliances already have different interest groups and playstyles among their numbers. What is it really that requires them to stay together in one coalition or even one alliance? If the players of sov-nullsec want things to be different than they are now, they should not look to CCP for changes in mechanics, but they should ask themselves that very question. Special bonus points for anybody who recognizes which text I am paraphrasing there.